He seems like yet another urban professional in Korea who has no life outside of his work. The 30-something is one of the most trusted employees at his work, and always gets things done right. But when he tries to quit his job, he faces a series of ordeals that tests his courage and fortitude. Director Im Sang-yoon’s feature debut “A Company Man” shows the extremes of Korea’s office politics, and the mundane lives of urban professionals who have almost literally nothing outside of their work. Action-packed but lacking character development, the movie could have been a lot better with a stronger script. Im, however, partially succeeds in creating a satirical portrait of Korea’s salaried employees and their work culture in a convincing setting. 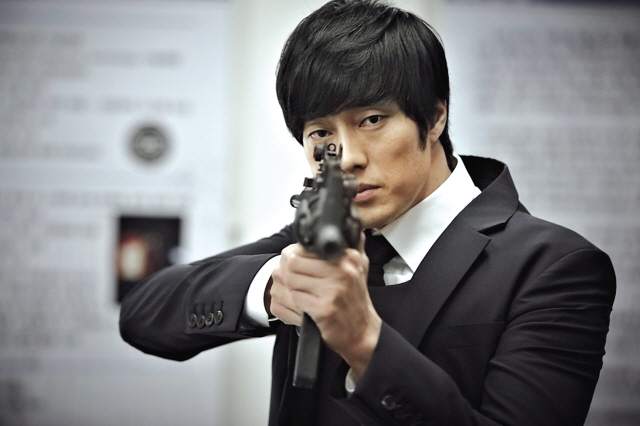 Main character Hyeong-do (So Ji-sub) is in fact a professional killer who works for an organization that disguises itself as an ordinary metal manufacturing company. He lives alone in a small studio with minimal furniture and owns at least 30 of the exact same black suits and white dress shirts — which he irons and wears to work every day. He is always quiet and cooperative, overly polite to his superiors. company. The young man is the opposite of Hyeong-do; he is curious and interested, though financially struggling. Hyeong-do is assigned to kill Hoon after the youngster finishes his mission, but lets him escape. A few days later, Hyeong-do finds out that Hoon’s mother Mi-yeon (Lee Mi- yeon) is in fact a has-been singer whom he was a fan of when he was a teenager. Meeting Hoon’s family makes Hyeong-do realize what he has been missing out on, and he eventually decides to quit his job. Suddenly, everyone at his work — whom he considered as his family — turns their back on him. Yet, many will find it hard to empathize with Hyeong-do, as it is never explained why he ended up being a professional killer to begin with. He has no family members to take care of, and no friends to hang out with outside his work. Because the viewers get no glimpse of the man’s past and upbringing, it is hard to understand why meeting Hoon’s family makes such a big difference in his life. Before running into the youngster, Hyeong-do was a ruthless, cold-hearted professional, who had never made a single mistake while carrying out his killing missions. His sudden transformation into a caring hero (he volunteers to risk his own life to protect Hoon and his family) is somewhat perplexing. Viewers can also tell that he forms special feelings for present-day Mi-yeon, who now is a single mother working at a shabby factory, but their romance seems rather unnecessary in the plot of the film. What’s rather convincing is Im’s depiction of Korea’s office culture. A group of killers, Hyeong-do’s company is extremely hierarchical and does not appreciate individualism. For instance, Hyeongdo’s incompetent colleague Jong-tae doesn’t even know how to use a gun. But Hyeong-do always has to obey him, simply because Jong-tae has worked longer at the organization than he. Hyeong-do’s studio, filled with the same black suits and white dress shirts, effectively reflects Hyeongdo’s life, a life filled only with the sense of responsibility and obedience. A Showbox/Mediaplex release, “A Company Man” is currently in theaters nationwide.